On September 2, 2016, a young woman posted a photo of herself dabbing on Twitter. This in-and-of itself is not unusual. Dabbing—which Know Your Meme helpfully defines as "a hip-hop dance that involves dropping one's head with one arm raised and resting the face inside of the elbow of the other arm, which essentially resembles the gesture of a polite attempt at muffling a loud sneeze"—was at that point quite popular throughout the United States and elsewhere. Earlier that year, Democratic presidential Hillary Clinton, for one, dabbed live on The Ellen Show. But what made this particular dab on September 2 so special and interesting was that the young woman behind it, Anicca Harriot, a 20-year-old senior majoring in biophysical sciences at Regent University in Virginia Beach, thought it would be fun to calculate and post the precise angle of her dab using trigonometry. It turned out to be 31.70 degrees. Harriot's subsequent tweet and calculation immediately went viral, garnering over 27,000 retweets (as of the time of this article) from people around the world, and prompting articles in Buzzfeed, BET, and Vanguard STEM, a website dedicated to women of color in the fields of science, tech, engineering, and mathematics. It even inspired similar calculations in far-off countries. "Someone from Argentina tweeted me that their teacher used my picture for a homework assignment," Harriot told Motherboard in a phone conversation. "And I saw posts where other teachers had their students calculate the angles of their dabs." Harriot was inspired by the outpouring of attention. After all, it's not often that a math problem goes viral online. And for Harriot, whose goal is to become a biochemist at NASA and eventually an astronaut, the popularity of her tweet led to more opportunities in the fields she's pursuing. "You can use social media to forge a path for yourself in a unique way through the connections you make." For example, late last year Vanguard STEM invited her to a pre-screening of the Oscar-nominated film Hidden Figures, which focuses on Katherine Johnson and the other African-American women mathematicians who were instrumental in the Apollo program in the 1960s. As an African-American woman herself, Harriot believes the film and the book upon which it's based (also titled Hidden Figures), are hugely important to bringing more diversity to STEM, which remain largely white- and male-dominated fields. "In Hidden Figures, there's a line that we get to together or not at all," Harriot says. "And when people have that mindset we get to accomplish incredible things. Hidden Figures is very important because it shows young black girls that they're not alone in their passion for STEM and science, and there are others like them in that field." But even before the popularity of her dab calculation, Harriot was well on her way to making connections in space exploration and medicine. She first became interested in biology as a young girl, when her mother and father bought her a microscope for a present one year. At age 17, Harriot interned at the National Institutes of Standards and Technology in Gaithersburg, Maryland, where she spent the summer helping conduct stem cell research. About a year ago, in February 2016, Harriot began attending NASA Socials, an ongoing effort from the space agency to host events around the US for its social media followers. 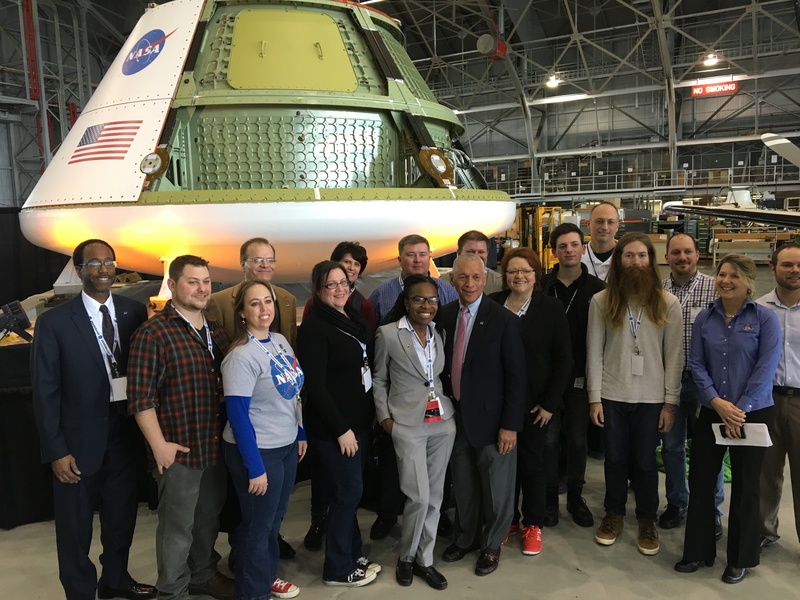 At her first event at NASA's Langley Research Center in Hampton, Virginia, Harriot not only heard NASA Administrator Charles Bolden speak on the "State of NASA," but she got to meet him (and posed with him in an official photo from the event). Last May, Harriot was able to attend the dedication ceremony for the Katherine Johnson Computational Research Facility under construction at Langley and was allowed to interview the 97-year-old Johnson, who worked as a pioneering mathematician at NASA for 33 years, beginning with its predecessor agency NACA, and through the early space program, moon landing, and the Space Shuttle program. "One thing that stuck out to me, of the things [Johnson] had to say: all of those women had a particular mindset." Harriot said. "Society was in a very tumultuous time back then. Even today there are a lot of difficulties for women in STEM, particularly women of color. But their focus was always on getting the job done and getting the job done properly. Those women already had their minds set on the moon, and it was that mindset of not letting the difficulty get in the way, and also that forward-looking vision that allowed them to achieve what they did." At that same event, Harriot also discovered NASA's Autonomy Incubator, an effort dedicated to developing more intelligent robots and machines. Later, she ended up volunteering as the Autonomy Incubator's social media coordinator, managing their various social accounts and blog—a fitting turn for someone whose moment of internet fame ultimately came from a social media post. Harriot is well aware of the dark side of social media, too. After her dab tweet went viral, she "had people tell me to kill myself, which was pretty surprising," as Harriot told Motherboard. But she said of the negative responses, "I didn't let it get to me." And fortunately, the response was, in her words, "overwhelmingly positive." "You can use social media to forge a path for yourself in a unique way through the connections you make," Harriot said. Harriot is set to graduate from Regent University in May 2017, and already has a clear idea of what she wants to do and how to go about it. Based on her success so far, it should be an exciting ride ahead, for her and for the rest of us following along on social media. And as for the dab heard round the world, it measured in it at a cool 31.70 degrees.